May we have some cheese to go with that wine, please? Starting next month, Andrew Steiner of Andrew's Cheese Shop in Santa Monica will provide the cheeses and provide notes on the wines as well. 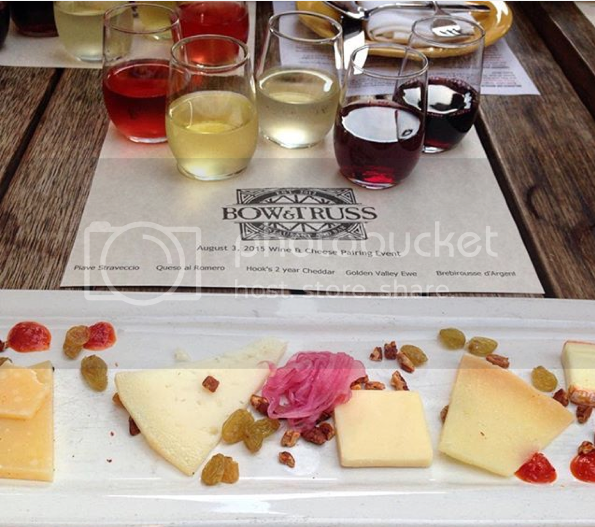 Why do cheese and wine go so well together? We asked Bow & Truss. Why does cheese go so well with wine? A: Most of everybody's favorite food pairs an astringent liquid or food, which causes the mouth to pucker up, with a fatty food . . . they oppose one another and create a balanced 'mouthfeel' - cheese is a perfect example with a high degree of fat content with amazing complex flavors. A: Chocolate is the confectionery match to wine - the process of making chocolate is very similar to wine. Cocoa beans and grapes are fermented with same yeast. Will you give us some tips on how to properly taste wine? Are there some quick wine etiquette rules we should follow so we don't look like winos? A: Clearly there aren't any 'rules' other than to be respectful of each other & enjoy the event . . . WHEN: The first Monday of each month from August to November.